Will FerrellGas Partners' Stock Be Able to Recover From 2016's 59% Decline? Last year was brutal for FerrellGas Partners' shareholders. If the weather cooperates, this year could see some big improvements. If you had bought shares of FerrellGas Partners (NYSE:FGP) at the beginning of 2016 for a stable income investment, then boy was that a lousy year for you. Not only did shares of FerrellGas Partners drop a tough-to-look-at 59%, but that lucrative distribution payment went up in smoke as well. With FerrellGas' very stable business model of distributing and selling propane, though, one has to wonder if this is just a one time problem or if there are some deeper issues to resolve before jumping back into this stock. So let's take a look at what caused all of this investor pain in 2016 and what the coming year has in store. If you look at a stock chart for FerrellGas Partners' stock, you might think that the only noteworthy events last year happened after September when the company reported earnings. To really understand why that was such a lousy time, though, you have to back up a little further. Starting in 2014, then-CEO Steve Wambold took on a big initiative to diversify the company away from its bread-and-butter propane distribution business with several acquisitions in the oil and gas midstream space. Those acquisitions included a fluid logistics business in the Eagle Ford shale basin and Bridger Logistics, a oil & gas transportation company. In less than a year, the company had acquired over $1 billion in new assets that didn't really overlap the company's existing business. Based on the first couple earnings reports, things were looking ok. Operating income was exceeding expectations from its Bridger business, which helped to offset the incredibly warm winter in late 2015/early 2016. However, interest payments on that new debt was creeping up and taking a decent sized chunk of the company's distributable cash flow. Also, costs from the merger weren't coming down as quickly as expected. These seemed at the time like surmountable issues, but then the wheels started to fall apart. In September, it came out that the Bridger subsidiary's largest revenue generating contract came from Jamex Marketing, a company that sourced crude oil at a rail terminal to sell to refineries in the Philadelphia region. Jamex stopped meeting its obligations under the contract, for which Bridger was liable. What is most concerning is that the company made no press releases regarding the issue and only disclosed it in a Friday evening submission to the SEC. You know, that time when all the bad news gets sent in. Basically, without this contract in place, Bridger's business was busted. All of this came to a head when the company announced its 2016 year end results in late September. The company announced several hundred million in write-offs for its midstream and fluid logistics business; the prompt resignation of CEO Wambold; it was in violation of its debt covenants; and that the company planned to cut its payout to shareholders. All of this pretty much sank the company's stock to a level from which it couldn't recover in a year. It was pretty clear based on the earnings release and conference call that management had been hit by a hay-maker and was trying to get reoriented. It knew that it would have to cut its payout to use that cash for repaying debt and bring it back in compliance with its covenants. So, it announced during that conference call that it expected to slash its payout from its current $2.05 per unit annualized distribution to around $1 for fiscal year 2017. That proved to be an ambitious target, though, as management announced in late November that its annualized payment would be $0.40 per unit. The decision to cut the payout so deeply was because management expected another warm winter. So here is the good news for investors in FerrellGas Partners. Probably, the worst is over. The company has reset its cash outlays in a way that it can handle a less than great winter as well as throw a decent amount of cash to pay down debt. Also, after such a large share price crash, FerrellGas Partners' stock yields a decent 4.6%. If we were to experience an incredibly warm winter, though, that could change the equation because propane distribution is highly seasonal and dependent on cold winters. For those looking for a fast recovery, though, don't hold your breath. Management estimates it will generate about $160 million in cash that can go toward debt repayments in fiscal 2017. However, to get to management's desired leverage ratio of total debt being less than 4.5 times adjusted EBITDA, we're talking about more than $600 million in debt reduction. If the company were to maintain that $160 million debt repayment schedule, we're looking at close to 4 years of debt repayment before getting back into a target range that would allow the company to raise its payout again. Granted, we could see EBITDA grow over that time and shorten that debt repayment window, but that's not necessarily a guarantee. So yeah, the company is on track to recover, but it's going to take a long time before the company is able to turn that recovery into an increasing payout for its shareholders. FerrellGas Partners was clearly reckless with its shopping spree over the past couple of years, and it came to a head in 2016 as some of those bets clearly didn't pay off. From an investor standpoint, probably the most concerning thing is that management tried to sweep these issues under the rug for a while. When you are trying to make a long term investment, though, you have to trust that the management team is being transparent and truthful. This incident ruined that trust. Perhaps now that James Ferrell is back in the CEO chair, many of those trust issues will be repaired. After all, this is his family's business and he has a very large stake in the company. 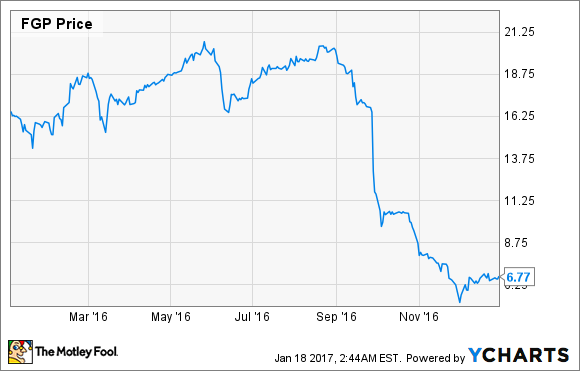 For investors looking at FerrellGas Partners as a potential investment in 2017, it looks as though the company is on the mend. It really depends on whether it's worth it for investors to buy this stock now when there is a long path ahead before the turnaround in this business benefits shareholders.